You’re ready to travel but none of your friends have the time, money, points or miles to travel with you. Or perhaps you would just like to try a solo adventure and experience the freedom of traveling alone. How far will your miles take you? You might be surprised. Here’s a trio of affordable destinations that can easily be reached using frequent flier miles. You won’t be alone for long in San Miguel de Allende. While you’ll quickly get to know the warm and friendly locals, you’ll also find the population of Americans, Canadians, and Europeans who live there more than welcoming. There will be invitations to art events, cocktail parties and even picnics soon after you immerse in San Miguel. It is also a place where you can spoil yourself. You’ll find inexpensive spa treatments, live music, and a festival every weekend. Spend a leisurely day at one of the natural hot springs nearby or hang out in the town plaza. There you’ll find a glorious cathedral and the community gathering place. Everything in San Miguel is affordable. A full breakfast is yours for $4, a serving of homemade gelato is about $1 and a glass of wine at an outdoor café is $4. San Miguel is located in the temperate mountain area of eastern Mexico. You can fly into Mexico City (MEX) or Leon, Mexico (BJX) but the closest airport is Queretaro International Airport (QRO), about an hour away. Transportaion through the lovely countryside to San Miguel can be secured for around $30 per person and takes about an hour. American Airlines offers off-peak economy MileSAAver Awards from the US starting at 12,500 miles each way and anytime level 1 award tickets for 25,000 each way. United Airlines Award tickets start at 17,500 miles but can reach 37,500 miles each way. Although Delta Air Lines does not publish an award chart, round trip award prices ranged from 45,500 to 70,000 miles from the US to Mexico when priced for April travel. Getting to Dublin, Ireland is easy and the city makes a great base for exploring the country. Spend a couple of days in Dublin, have a brew with the locals then head out to discover the rest of the country and Northern Ireland. Traveling by train is the perfect transport option for the solo traveler. It’s safe, affordable and easy to navigate. Head to the north and visit the Titanic Museum in Belfast then travel on to Londonderry. Although just 1.5 hours in length, the rail journey between the two cities, passing through Coleraine in Northern Ireland, is said to be one of the most beautiful in the world and costs only around $15. Or head south a few hours and use Killarney as your base to venture around the Ring of Kerry. West of Dublin, about a 5-hour round trip train journey, you’ll find the historical city of Galway, complete with castles, cathedrals, medieval walls, a Latin Quarter, and Galway Bay. United Airlines round-trip economy award tickets start at 60,000 miles and American Airlines economy award tickets at 22,500 miles to 47,500 each way. 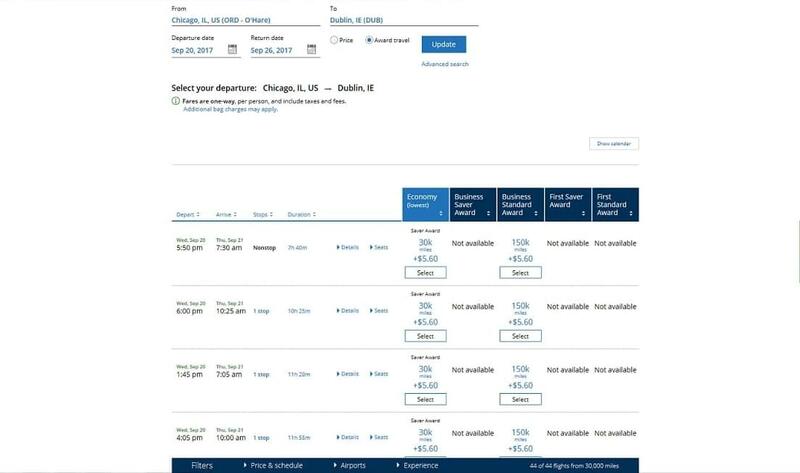 Delta Air Lines has no award charts but you can find economy award tickets to Dublin for 60,000-70,000 miles round trip. One might not consider traveling to Alaska solo but in fact it is a perfect destination to explore on your own. One reason is the ease of getting from one area to another and also the opportunity to meet up with other travelers along the way. The Alaska Marine Highway System (AMHS) and the Alaska Railroad offer great transportation alternatives that provide a relaxing way to enjoy the scenery and an environment for social interaction if you desire. Alaska is not an inexpensive destination, but you can visit on a budget. Securing an inexpensive cabin on the AMHS allows you to forgo expensive hotel rooms, and bringing your own food and drink saves even more. No matter which area of the lower 48 states you live in, it’s easy to get to Alaska using your miles. Alaska Airlines offers one-way economy fares based on distance that cost between 12,500 to 30,000 miles for flights longer than 2,100 miles. For trips 701-2100 miles, you’ll pay between 7,500 and 20,000 miles. Short flights on Alaska Airlines, however, start at 5,000 miles for flights under 700 miles in distance – perfect for hopping between Alaskan cities. On American Airlines one-way economy award flights can be found starting at 15,000 miles. 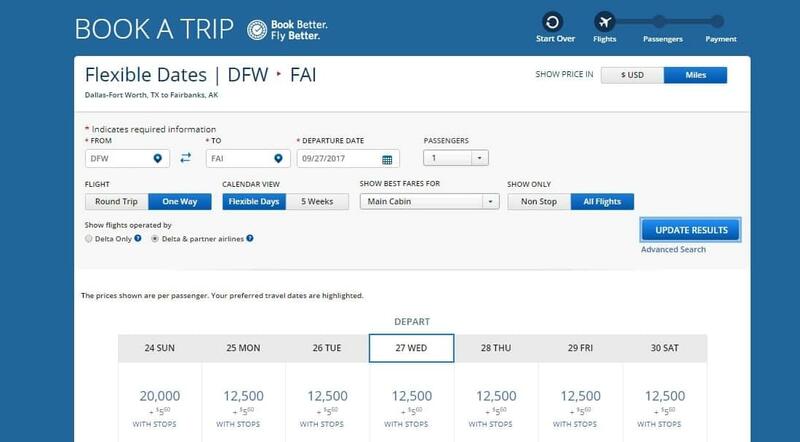 You can find low-level economy award tickets on Delta Air Lines for as little as 12,500 miles each way but the cost can surge to 45,000 miles for a peak one-way award ticket. Keep in mind that your frequent flyer miles can be used to purchase award tickets on partner airlines. You can view a list of these options by referencing your frequent flier program’s award chart for those partner airlines or checking rewardexpert.com. Examples would include being able to use Alaska Airline miles on American Airlines or United Airline miles on Lufthansa. Travel on the shoulder season for more award space availability and award flights that cost less. Continue to earn rewards while you travel by utilizing credit cards that earn multiple points for your travel purchases such as the Citi Thank You Premier Card which earns 3X points for flights, hotels, gas, and car rentals. Credit cards such as Discover it or Discover it Miles earn rewards that can offset your travel expenses such as local transportation and tours. Traveling solo can be rewarding and fun but even more enjoyable when you’ve secured free flights using miles.